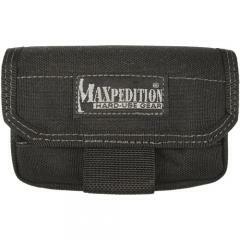 The Maxpedition Volta Battery Pouch makes it easy to carry a variety of batteries into the field, allowing you to keep your essential electronic devices running. It comes with a convenient BATUCA battery insert that provides space for up to eight CR123, AA or AAA batteries. The insert can be separated into two sections for easy discrimination between fresh and spent batteries, and is colored to make visual identification easier. The pouch can also be used to carry up to five 12 gauge shotgun shells. It is made from durable 1000 denier nylon fabric, with a water-resistant triple polyurethane coating and a grime-repelling Teflon fabric protector. The top flap features a hook and loop closure that fastens securely while also providing quick access.